The US says “all options are on the table” in response to a suspected chemical weapons attack in Syria, as Western leaders continue to weigh up military action. White House spokeswoman Sarah Sanders told reporters that a final decision on military strikes had not been taken. But it seems that the Russians have prepared for something more! At least from what we can hear from a presenter on state-run broadcaster Vesti 24 who told the viewers to collect ‘fewer sweets and more water’ in a public broadcast. 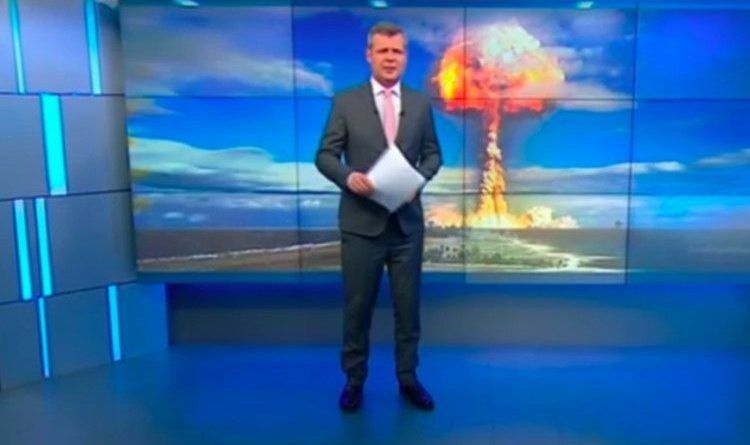 He conducted while standing in front of a mushroom cloud synonymous with a nuclear bomb. Viewers were told to pack rice – ‘it can be stored for up to eight years, oatmeal for three to seven years’ – but to forego Russian favorite buckwheat which only lasts a year. The presenter pointed out that anonymous sources were instructing Russians to stockpile certain types of foods. Foods such as rice, oatmeal, and sugar, reports Vice News. It should be noted that real panic isn’t here but across the ocean. ‘Obviously, you can survive on tinned meat for quite a while – up to five years, while canned fish keeps for not more than two years. ‘Of course it is hard to do without milk, at least powdered, sugar and salt. Russian tradition suggests we should buy pasta in times of cataclysms. Do you think that they went too far?